1. Do we really need, logically, to believe in a God? 2. Does life have an inherent meaning? 4. On what basis should the life of human beings together be organised? 6. Capitalism or socialism? The only choice? God and science: Are they reconcilable? What is the significance of language? …or does it only have the meaning or meanings that we ascribe to it? If life in general and our life in particular do have an inherent meaning, we would have to assume that that meaning was created or made possible by a conscious being. Put another way: the universe, and the Earth within it, and our life on the Earth can only have an inherent meaning if there is a conscious being who is its original cause and is responsible for bringing it all about for a particular purpose, thereby imbuing it with a particular meaning. That is because of the self-evidence that only something conscious can have a meaning to its activity. Something non-conscious – a stone, for example – cannot have its own meaning or purpose: it cannot act by itself. We can say of a man-made object such as a table that it has a purpose – to be sat at, eaten on etc. – but then we are referring to the purpose ascribed to it by the conscious being who made it. But a table doesn’t itself have its own meaning or purpose; it is not conscious and so can’t act of its own accord. The problem then is that historically no logical purpose has been proposed by any of the traditions that believe in a conscious original cause. This is because no tradition puts forward the idea that God has a need, a need that could give rise to a logical purpose [UR p.23]. (See also UR p.133). 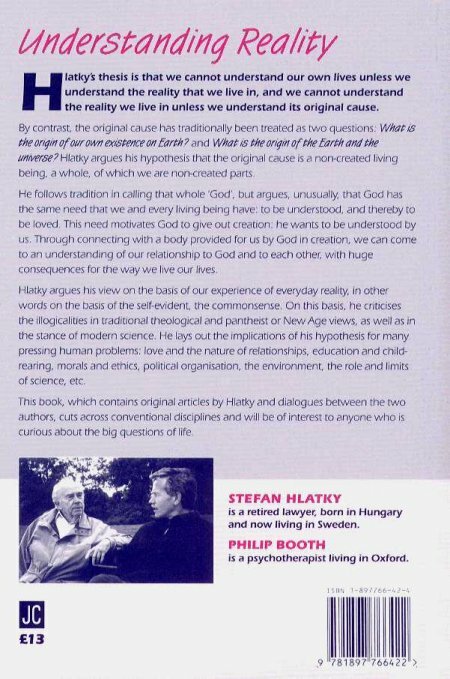 On the basis of the self-evidence that every conscious being has the need for love – relationship, company, the experience of mutuality – Hlatky suggests that God must have this same need. In God’s case, it is a need that, self-evidently, can only be satisfied in relation to his parts. Further, the universe – which, if we agree that the original cause must be a conscious being, can be called ‘creation’ – has to be perfect for God’s purpose of making himself known, albeit indirectly, to the parts [UR p.26]. And since he is bound by his need – as the natural need of every conscious being is binding – God is compelled to give out creation if he is to meet his need [UR p.24] (See also UR pp.53-4, or UR p.31). At the same time, God’s creation allows us – the parts – to meet the same need for love that we share with God. So in Hlatky’s view there is a given meaning to the activity that the universe or creation represents. It is a meaning to which we should relate – in the same way as we need to relate to the meaning of any other conscious being. With regard to other conscious beings, their meanings are obvious to us through their behaviour (since we have, in principle, the same needs that they have) and, in the case of humans, also through their words. In the case of God, that ‘behaviour’, that ‘language’, is the universe as we experience it, the meaning of which we have to decipher. An important aside: If we understand God’s meaning, then we understand why God creates. But we can never understand how God creates, because of our position inside God [UR p.65]. But to understand why God creates is to understand God. We don’t need to know the how. Note that young children always ask ‘Why?’, not ‘How?’ (until the grown-ups, unclear about the ‘Why?’, push them towards the ‘How?’), and are always satisfied by a logical answer to the question ‘Why?’ [UR pp.112-3]. That life might be about the need for love – the experience of mutuality – is not a new idea; it is alluded to in many worldviews. What seems to us to be lacking is a philosophy that gives this central importance while underpinning it in a reality-based way, that is, in a way that can be equally convincing to all. Without a given, reality-based meaning that we need to relate to, we will seek to create our own meanings. Indeed, we must, since we cannot live without meaning. This gives rise to the problem of how to coordinate all the disparate, frequently competing, individual meanings that humans come up with – a thankless task that generally falls to politicians. Imagine how different it would be if everyone took the view that the meaning of their own life is given, and is the same as the meaning of everyone else’s life, and if this informed the way we went about the business of meeting our reality-based needs. (For expansion of this point, see UR p.42 ; or UR p.70; or UR p.103). 1. For the importance of the use of language in this question, see UR p.110. 2. 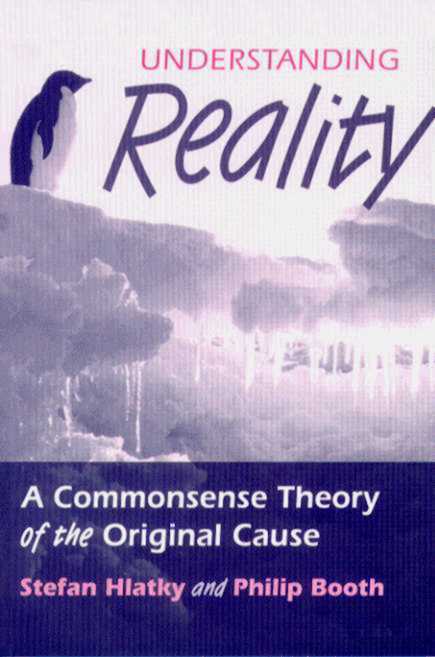 For the clear contrast between Hlatky’s view and that of modern (atheistic) science on this theme, see UR p.37; and as this theme relates to differing concepts of consciousness, see UR pp.96-8. Next Post 1. Do we really need, logically, to believe in a God?